This water resource plan is the prevailing management plan for the surface water and groundwater resources in the Warrego-Paroo-Nebine water resource plan area. The plan was accredited by the Australian Government minister as being consistent with the Basin Plan on 15 June 2017. The Minister’s decision instrument and the explanatory statement are available on the Federal Register of Legislation. 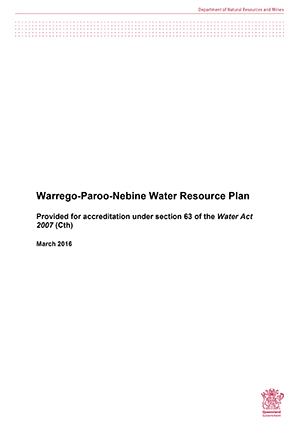 The Warrego–Paroo–Nebine water resource plan is made up of a number of documents. The key document is the Warrego-Paroo-Nebine water resource plan. The index in the Warrego-Paroo-Nebine water resource plan identifies the documents and instruments that meet each requirement for water resource plans, as set out in chapter 10 of the Basin Plan. The accredited versions of these documents are available below. If you experience any difficulties with accessing any of these documents please email us to request an alternative format.